How Much Does a Church Sign Cost? A church sign announces your presence to the world, acts as a useful communication tool between you and your congregation, and potentially even draws new people to your church community. But you're probably wondering, how much does a church sign cost? Well, the answer can vary widely depending on the type of sign you want. Learn about what features impact price. As a rule of thumb, custom church signs tend to cost more than stock signs. Stock signs are pre-printed with pre-established designs. For instance, no smoking signs, reserved parking, fire safety signs, and countless other signs are used in a variety of environments, and you may want some of these stock signs in your church. However, if you're putting a sign outside your church to let others know about your ministry, that sign needs to be a custom design featuring your church name and logo. When you choose a custom sign, the complexity of your design can also affect the final cost. The more details and colors you want to be integrated into your sign, the higher the final cost is likely to be. Additionally, many sign manufacturers offer design services. Essentially, you let the designer know what you want, and they create a design that reflects your ideas. Most quality outdoor church signs have an area where you can add a custom design. For instance, light box signs feature your church name along with your choice of color and graphics, and the message is lit from the back to boost visibility at all times of the day or night. Similarly, a changeable letter sign or an LED sign has a light box portion where you can display your unique design along with an LED screen or message area. Church signs can also come in a range of materials. A simple vinyl banner may not cost that much, regardless of the complexity of your design, but when you opt for durable, long lasting materials, the price increases. Steel tends to cost more on average than aluminum and plastic. Many churches opt for a monument style design. That consists of a masonry-inspired frame around a light box, changeable letter, or LED sign, and typically, adding this framing adds an element of elegance to your sign but tends to cost more than standard options. As indicated above, your church sign can have several different technical elements. If you choose a changeable letter sign where you must manually alter the messages, that process takes longer than using an LED sign where you can simply program in different messages. However, in exchange for the extra cost, you get to save time — changing your message with software can be done quickly and easily from anywhere you have an internet connection. In contrast, dealing with a changeable letter sign can take a lot more time, and of course, the job requires your physical presence. Additionally, you also get more features with an LED sign. Depending on your preferences, you can integrate videos, program multiple messages to appear at different times in the day, or even broadcast posts from your social media pages. While deciding on the right sign for your church, take some time to think about the operational costs of your sign. Lightbox and LED signs both require you to supply power to the sign. Although LED bulbs help to keep the costs as low as possible, you may want to get some estimates and consider how both types of signs are going to affect your church's electrical bills. With a changeable letter sign, you need to consider electrical costs if the sign has a light box element or is backlit, and there's also the cost of time. Do you have someone who can think of fun messages and take the time to put those thoughts on the sign? 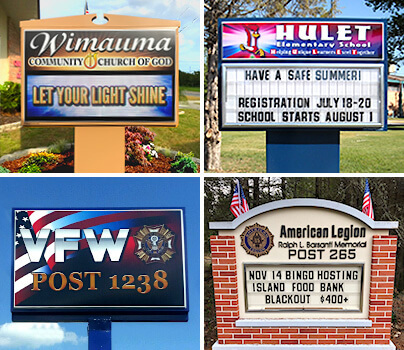 If you don't have an employee or volunteer with time to spare, you may find it easier to explore the time-saving features of a programmable LED church sign. Finally, when choosing a company to put in your church sign, make sure to talk about installation costs. As you shop around for the best value, it's important to ensure that you are comparing apples to apples. In addition to installation, you may also want to talk about warranties. If a sign company can reassure you that you don't have to worry about manufacturer's defects or installation mistakes, you can avoid unplanned operational expenses or replacement costs. A church sign is an investment into your church. Ideally, you should choose a company that specializes in church signs. They can guide you to the right sign for your needs, and they can answer all your questions so that you understand exactly how different materials, sizes, technology, and other elements are going to affect the price of your sign. To learn more or to get a custom quote on the best sign for your situation, contact us today.